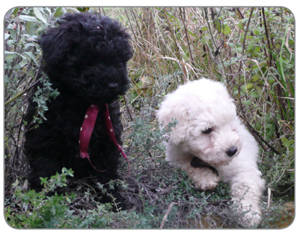 Dog ownership and buying a puppy, let alone a Puli, are major decisions and ones that should not be undertaken lightly. Apart from the initial purchase price, the Kennel Club estimate that the ongoing expenses such as food, veterinary fees and canine insurance can cost roughly £25 a week. Other considerations include; life/work balance, the size of your home, who will be at home to care for the puppy, daily exercise, training and grooming; the latter being a major commitment in the case of a Puli. The average lifespan of a Puli appears to be roughly 12 years and therefore breeders would expect you to give a lifelong commitment to their puppy. Are you in a position to do that? Before even beginning to think about making enquires about the availability of a puppy, it is best to do as much research as possible. What do you know about the nature of Puli and the care demands that comes with it? The KC regulates several Championships show each year around the UK, including the Hungarian Puli Club of GB’s one Open Show and one Championship show each year. In addition there is Discover Dogs held annually in London and during Crufts in March at the NEC in Birmingham. If you contact either the Kennel Club or the HPC of GB you will hopefully be able to find the location of one or two of these shows so that you can see the breed in numbers. This will give you the chance to meet breeders and owners to ask the many questions you may have. Where do I find a breeder and a litter? The KC offers a ‘Find a breed’ page on their website and lists members of their Accredited Breeders Scheme and the HPC of GB have a regularly updated ‘Litters available’ on their website too. However, it is worth bearing in mind that the number of Puli puppies born and registered with the KC can be few and far between. In 2012 there were only 71 and in 2013 that number was only 30. In a 10 year period between 2004 &1013 the average works out at 65 puppies per year, so you may have to wait some considerable time, however, as the old adage goes ‘Good things are worth waiting for’. It is also worth noting that as breeders are spread to all four corners of the UK, you may have to travel some considerable distance to view/collect your potential puppy. The Hungarian Puli is a breed that generally benefits from good health and can stay active and be long lived. However like all breeds there are areas of health that need to be monitored and responsible breeders and owner’s hip score for Hip Dysphasia and eye test for Multifocal Retinal Dysplasia (MRD). The Hungarian Puli Club of Great Britain is keen to encourage its members, breeders and Puli enthusiasts to hip score and eye test their Pulis. Additionally a genetically inherited disease has been identified, has now sadly reached a limited number of lines the USA, Europe and in the UK too; Degenerative Myelopathy (DM) is the general medical term that refers to the disease of the dog’s spinal cord or bone marrow. You would need to discuss this further with the breeder of any potential puppy you were considering buying from. At the 2016 AGM of the HPC of GB, testing for this condition became essential for all breeding stock and this requirement was added to the Club’s Code of Ethics for all members and will be fully applicable by March 2017. All reputable breeders will happily explain all the health issues involved in the breed, but as a minimum standard, both parents of a litter should have been Hip Scored , been tested for Multifocal Retinal Dysplasia (MRD), when they were in their respective litters, and again as an adult. In addition you should ask if both parents have a DM certificates and by March 2017 they should not have been bred without one, unless their parents have both been tested as DM Unaffected. The HPC of GB would advise that unless both parents have had all these tests carried out, that you do not pursue purchase. The HPC of GB Code of Ethics requires the mother of the litter to be no younger than 18 months at the time of mating and that the father is to be no younger than 12 months. Both must be Hip Scored and Eye tested and the results known before the mating took place. A copy of the Code of Ethics can be downloaded either from the HPC of GB Website or their Facebook webpage. Occasionally older dogs, which without fault of their own require new homes, are available for adoption. The reasons for them being available can be many and varied, such as death of their owner, divorce or family break up, change in jobs or locations, but whatever it may be; rarely young examples of the breed are to be found in this situation. However, if you do not feel a puppy is for you, this may be a viable route for you to take. If you wish to consider this option, please forward your details to the Hon Sec to be passed to the W & R Coordinator, and your name will be added onto the waiting list for consideration. How long will I have to wait for a puppy? It is not possible to give a definitive answer to this question, but if you are fortunate enough to find a litter, a puppy would not be ready to leave its mother before 8 weeks of age and the litter has been tested for Multifocal Retinal Dysplasia (another MRD test should be carried out by the owner after its first birthday), but some breeders will keep them as long as 12 -14 weeks before they allow them to leave. Every puppy should come with a diet sheet and the KC registration, if available (occasionally processing can be delayed at certain times of year) but should this be the case, this should be forwarded to you in only a few weeks. Puppies have usually had their first health check with the breeder’s own vet and the details of that vet will be passed on to you at the time of purchase. Good breeders will always be happy to offer advice and support, not only at the time of the sale of the puppy, but throughout the life of your Puli, and in fact many good friendships have been forged in this way. What are the pitfalls of buying a puppy from a Commercial Website or from abroad? The HPC of GB’s Code of Ethics does not allow member breeders to sell their puppies via commercial dog wholesalers, retail pet dealers, online commercial websites or via a third party. As a buyer you would have no access to the actual breeder, you have no idea of the conditions the puppy was brought up in, you will not be able to see the puppy with its mother etc etc. As the only resort to recompense to what can be very significant vet’s bills, to say nothing of the emotional turmoil involved, is the ‘Sale of Goods Act’. One has to ask if it would be any wiser to buy a puppy from a known puppy farmer or a back street breeder? In recent years, since the changes to the Pet Passport scheme, the press have reported puppies bought from commercial puppy retailers being impounded as they do not hold the necessary, or even hold forged paperwork. Is that a risk you would really wish to take? If you buy a puppy in the UK from a respected breeder you have the opportunity to meet with the breeder, see the puppy with its mother and sometimes father or at least have details of where you can contact the owner of the father. As they say in modern parlance, it’s a ‘No Brainer’ really. Buying a puppy from abroad can have several pitfalls too. If the person wishing to import is someone with experience and has a relationship with the breeder and support from other experienced people in the UK, there tends to be few problems. The majority of problems arise when people who are new to the breed buy blind and decide to buy a puppy from overseas, usually because they are cheaper or more readily available. You have no idea if the breeder is a commercial breeder or a puppy farmer. Unless you have been out to see the puppy ‘in situ’, often the first meeting with the puppy is when it arrives in the UK. There is unlikely to be any breeder support and whilst you may have chosen a puppy from photos are you sure that the one you have chosen is the one you actually receive? The parents may have been seen in photos too, but you have no idea of their nature or temperament. Cultural differences in how a puppy should be raised and socialised, if at all, can also differ dramatically. Remember that puppy farmers and con artists are no different to those met in the UK. Your puppy may not be pure bred, promised registration papers may never arrive, health problems may be hidden until such time they could cause issues in later life, leading to heartache and huge vet bills. In short, the importation of a puppy should not be considered unless you have considerable experience of the breed and sound knowledge of the breeder you are importing it from.